The 10 Best Places for Fried Chicken in Wisconsin! Geographically speaking, Wisconsin is far from the south. But we Wisconsinites sure do make a mean fried chicken! Check out our favorite places to get fried chicken in the state! TomKen’s is a family-owned fried chicken hot spot. They are home to the Friendly Fried Chicken, which includes a four-piece fried chicken basket served with French fries, coleslaw, and bread. TomKen’s has been named champion of the Milwaukee Wing Fest six years in a row! You can feel at peace knowing that the food you eat at Graze comes from local farmers in the region. Their dinner menu features a one of a kind dish—hot chicken and pickles. You’ll enjoys a broasted chicken, waffle, maple syrup, and cayenne butter. Feel better about what you eat when you sit down at Graze in Madison. Champion Chicken is another Milwaukee favorite. Commonly ordered dinners are the fried chicken dinner. You’ll get four pieces of their famous pressure-fried chicken, with a side of coleslaw, French fries, and don’t forget your cup of frozen custard. All for under $8. Bring your little ones in for a Jr. Chicken Dinner! There’s something absolutely stunning about the chicken at Chicken Lips in Sun Prairie and we just can’t put our fingers on it. Formerly known as Buckshots, new owners have taken Chicken Lips to a whole new level. Come see the mouthwatering magic for yourself! Gold Rush Chicken has two area locations for Milwaukee residents to enjoy some of the best fried chicken! Their House Special consists of a 12-piece bucket of fried chicken, a large fry, rolls to enjoy, and coleslaw. This dinner can satisfy your family all for $23. 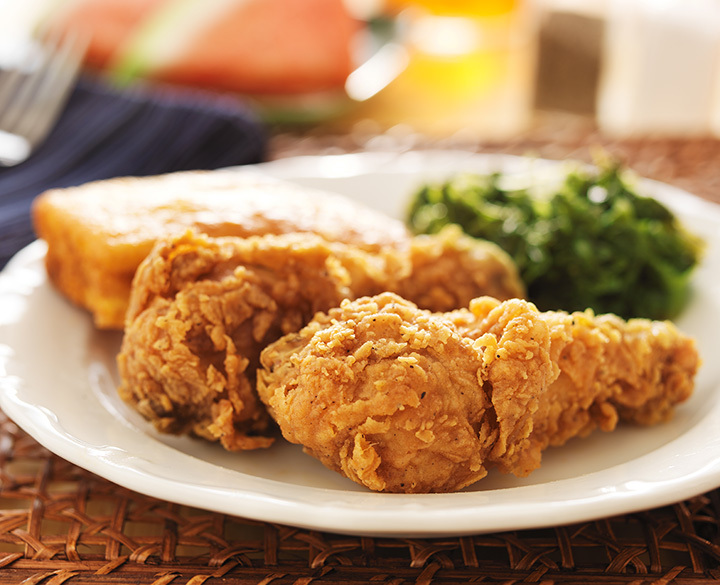 Save the cooking and pick up the House Special at Gold Rush Chicken. Golden Chicken in Waukesha is the perfect place to come hungry. Their fried chicken buckets range from eight to 36 pieces. Golden Chicken offers delectable dinner favorites like their chicken dinner and chicken snack—always served with French fries, coleslaw, and a bun. Most famously known for their pizza, Filippo’s has some of the tastiest chicken in the Wauwatosa area. Filippo’s Super Family Special included a 12-piece bucket of chicken, paired with crispy fries, coleslaw, warm buns, and let’s not forget a 16-inch two topping pizza. Feed the entire family and then some for under $45! The name says it all—if you’re looking for chicken from the south—New Orleans Take-Out is the place to be. Since 1985 they have been blessing the Madison area with all of the specialties from the south. As a 2016 recipient of Madison Magazine’s Best of Madison, you know you’re getting quality food. They have a few chicken favorites on their menu, check them out today! While Quivey’s Grove by no means specialized in fried chicken, you can be sure to get a tasty dish off of their menu. Try their fabulous Cross Plains chicken dish. Crispy buttermilk fried chicken served with smashed potatoes doused in butter and garlic. You can’t beat a classic like meat and potatoes. The Maple Tree Super Club really does it all. Located right off of US-51 their wide menu will be sure to please everyone. If you’re looking for the perfect fried chicken dish ask about their broasted chicken dishes. Other chicken favorites can be found throughout their menu.